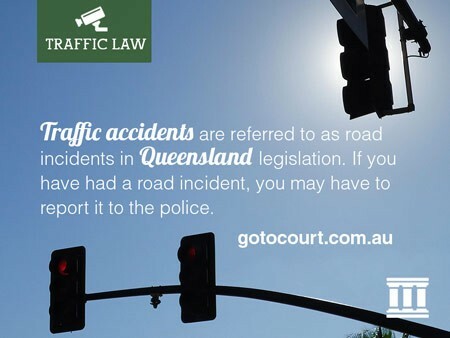 Traffic accidents are referred to as road incidents in Queensland legislation. If you have had a road incident, you may have to report it to the police. This is known as a reportable incident. Minor incidents may not have to be reported. According to section 92(1)(a)(i) of the Transport Operations (Road Use Management) Act 1995, if you are involved in a road incident you are required to immediately stop your vehicle, and seek medical aid if someone has been injured or has died as a consequence of the road incident, or if the road incident has created a hazardous environment. Hazardous environments can arise if the road incident has blocked the road, knocked down power lines, or caused a fuel leakage. Calling the police must be done as soon as possible. If these circumstances have not arisen, you may still have to call Policelink on 131 444 or use the Policelink app to report the road incident if you suspect that the other driver was under the influence of alcohol or drugs, the other driver is disabled or impaired and requires police assistance, your vehicle needs to be towed, or the other driver fails to provide you with their required details. Regulation 287 of the Transport Operations (Road Use Management – Road Rules) Regulations 2009 sets out the duties of drivers involved in the crash. The details that parties (drivers, injured passengers or pedestrians, owners of damaged property) should exchange include names and addresses, names and addresses of the vehicles owners, vehicle registration numbers and other particulars to identify the vehicles such as the colour and make. Reportable road incidents must be reported to the police by all drivers involved in the crash, while witnesses, pedestrians, cyclists and passengers have the option to report as well. This must be done within 24 hours of the crash. The police may choose to run an investigation into a road incident. They will do so if there has been a death or injury, there has been confirmed involvement of drink or drug driving, or the driver refuses to give their details. It is the police officer’s discretion whether to investigate any crash outside of these circumstances. Regardless of whether and investigation will be undertaken, the attending police officer will write a traffic incident report. If the road incident is minor and none of the ‘reportable’ circumstances exist, you can exchange details with the other driver(s) or people involved and then drive your vehicle away. You can still report the road incident to the police for insurance purposes, however it is unlikely a police officer will attend the scene, and there will not be an investigation. Police policies regarding attendance at road incident sites were relaxed on 1 January 2015 as it was viewed that minor accidents did not require police attendance. Prior to 1 January 2015, there was a requirement that the incident was to be reported to the police if the incident had caused over $2,500 worth of damage. The amendments to the law removed that requirement, therefore reducing the amount of traffic incident related police call-outs. Section 92 of the Act states that if you are in an accident that has caused injury or death, you must stop at the scene, attempt to assist any injured person, and do whatever is reasonably practical to protect any body, or move it to an appropriate place until assistance arrives. Failure to do so may attract a fine of 20 penalty units ($2,277) or one year’s imprisonment. Imprisonment is more likely if it is proven that the person showed a callous disregard to the safety and protection of the injured person. Regulation 287 of the Transport Operations (Road Use Management) Regulations 2009 stipulates that a failure to abide by the duties of drivers set out in that regulation is an offence which carries a maximum penalty of 20 penalty units ($2,277). If a person falsely reports an accident involving injury or death, they face six months imprisonment or a fine of 40 penalty units ($4,554).